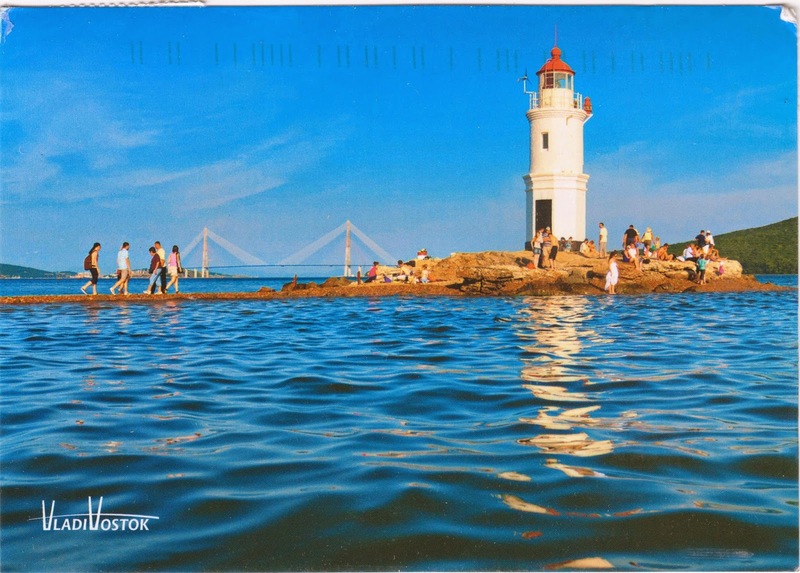 Postcard RU-3526905 from Russia shows the Tokarevskaya Koshka Lighthouse (Tokarev Lighthouse) in the Vladivostok Harbor at Russia's Far East. With 603,244 residents as of 2010, Vladivostok is a city and the administrative center of Primorsky Krai, Russia, located at the head of the Golden Horn Bay, not far from Russia's borders with China and North Korea. The city is the home port of the Russian Pacific Fleet and the largest Russian port on the Pacific Ocean. According to the listing of lighthouses of Russia: Vladivostok area from the Lighthouse Directory at UNC, the Tokarev Lighthouse was built in 1910 with the station established in 1876. With its focal plant at 12 meters or 39 feet, it is a cylindrical stone tower that has lantern, gallery and an octagonal base. In spite of its modest size, it is one of Russia's best known lighthouses. The lighthouse was named after Capt. M.J. Tokarev, whose ship surveyed the area between 1862 and 1863. Located at the entrance to the Vladivostok Harbor on the extreme south-westernmost point of the Egersheld Peninsula, the lighthouse site is accessible through a breakwater, 3 kilometers or 2 miles from the end of the nearest bus line. However, the breakwater is submerged at high tide. In addition, the tower itself is closed to the public. "Remembering Letters and Postcards" blog shows a postcard of the Tokarev Lighthouse with a different view. Two of the three postcards of the Tokarev Lighthouse showcased on "My World of Postcards" blog were of beautiful winter scenes. The other card came with a 15p stamp issued in 2010 to commemorate the 150th Anniversary of the City of Vladivostok, featuring the Tokarev Lighthouse.